MEDIA | Welcome to markchosak.com ! Steely Jam performing “Kid Charlemagne” (Steely Dan) at The Moose, Santa Monica, CA. Steely Jam performing “Bodhisattva” (Steely Dan) at The Bandshell, Central Park, Playa Vista, CA. Steely Jam performing “Aja” (Steely Dan) at The Moose, Santa Monica, CA. Steely Jam performing “Don’t Take Me Alive” (Steely Dan) at The Bandshell, Central Park, Playa Vista, CA. The Struggle performing a medley of jazz tunes at Asylum Brewing, Anaheim, CA. Steely Jam performing “Green Earrings” (Steely Dan) at Typhoon, Santa Monica, CA. Steely Jam performing “Reelin’ In The Years” (Steely Dan) at Central Park, Playa Vista, CA. Steely Jam performing “My Old School” (Steely Dan) at Central Park, Playa Vista, CA. Sully & The Blue-Eyed Soul Band performing “Got To Get You Into My Life” (Medley) at The Belly Up, Solana Beach, CA. Steely Jam performing “Haitian Divorce” (Steely Dan) at Central Park, Playa Vista, CA. Bliss Bomb performing “Come Together” (Beatles) at Club Barre, Hollywood, CA. 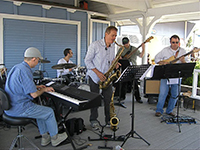 Mark Harrison Quintet performing “Funk To Go” at Shoreline Village, Long Beach, CA. Mark Harrison Quintet performing “Fries with That” at The Baked Potato, Hollywood, CA. 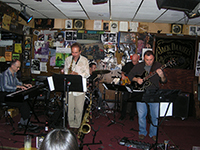 Pretzel Logic performing “Green Earrings” (Steely Dan) at The Baked Potato, Studio City, CA. Pretzel Logic performing “Josie” (Steely Dan) at The Baked Potato, Studio City, CA. Pretzel Logic performing “Green Flower Street” (Steely Dan) at The Baked Potato, Studio City, CA.